Words cannot describe how excited I was to open this email and then to see our beautiful photos! Words cannot capture my thanks for the ease of the process, speed in receiving our photos and your amazing product. You will most definitely be seeing us again next year. These are just awesome! You're definitely good at what you do to have managed to catch all of us looking good and all in the same direction!! I was skeptical. LOL. I definitely hope you keep doing it as you will see again next year (and most of my friends too by the responses! Thanks again. These photos are a massive hit, especially with my family back in NY and Boston. Have your kids photos with Santa with an Aussie feel. Our Santa will be set up at Long Reef Beach on Sydney's Northern Beaches for your family to come down and capture the essence of Christmas in Sydney. No need to wait in queues for your time with Santa, our bookings are 5mins per family, made in advance, and you'll receive 3 high resolution images to post, email, print as you wish. You could even use the photos for your family Christmas cards. Each booking of 5 mins includes 3 high resolution images available for download within 72 hours. If you'd like to go on our email list to be notified when 2019 dates are available for booking please complete the form below. Thank you! 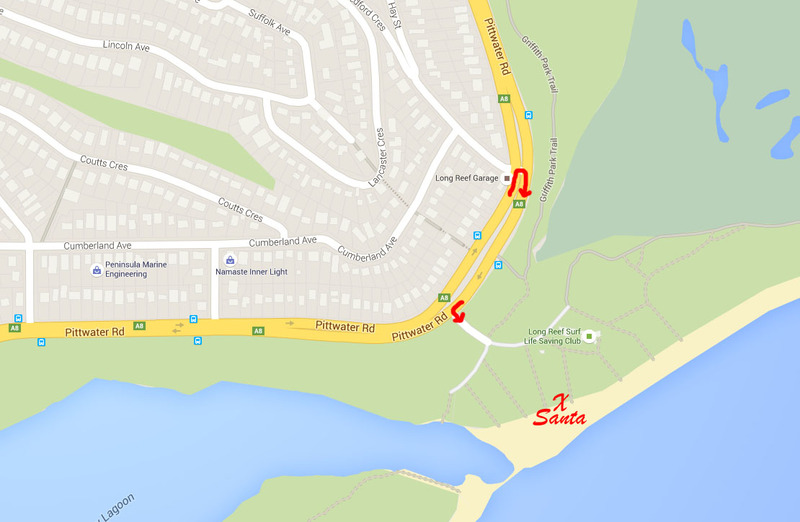 Santa will be located at Long Reef Beach, at the end of the path through the dunes from the Surf Club. To access the Surf Club carpark if you are travelling from the south you will need to travel past the entrance and do a U turn as indicated on the map. Please note our location may change depending on the weather conditions so look for signs from the car park. What you wear will make all the difference to the final produce. Combinations of red, green, white and navy work well, or any combination of neutral colours you like. The best tip is to lay them all out on a bed and ensure that if all the clothes were somehow worn on the one person they wouldn't clash. Please come as Christmasy as you like, it adds to the fun. Please also note it can be very bright at the beach, even though we face the children away from the sun the sand is very light and reflects a lot of light. If you or your children struggle with bright like please consider adding sunglasses to your outfit for the day. Yes, we recommend you book a couple of consecutive sessions to ensure you get more options for photos, as there are 3 images per session. Northern Beaches Council do not permit dogs on the beach. However, many families carry their dogs and bring them with them. It's your decision. What's the best time of day for photos? The later in the day the better, the sunset light at Long Reef Beach is always beautiful to if you can bring the kids down after dinner that would be the best option. Thanks so much for these wonderful photos! They are fabulous and I simply love how they have turned out. Definitely going to plan this for Santa Photos every year!